By Kayla Colgrove, MS, RDN, ACSM-CPT, Extension Educator, Lancaster Co.
1. 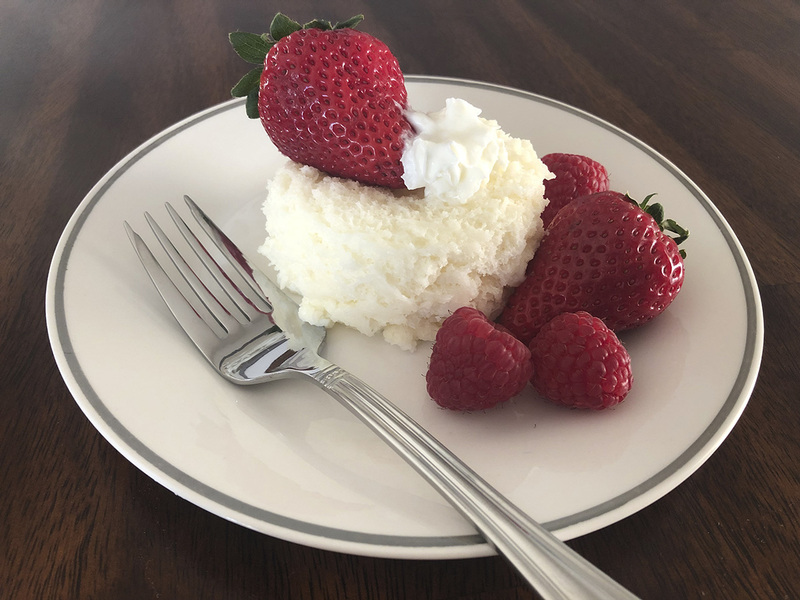 Scoop 3 tablespoons of angel food cake mix into a microwave-safe cup or mug. 2. Add 2 tablespoons of vanilla yogurt and stir. 3. Place in the center of the microwave oven and microwave for 1 minute. 4. Take out of microwave and let cool for 1 minute. 5. Using a knife, cut around the sides of the cup to loosen the cake and “dump” it on a plate. 6. Dollop 1 tablespoon of whipped topping on top of the cake. 7. Sprinkle raspberries around the angel food cake and add sliced strawberries to top. Source: What’s Cooking? USDA Mixing Bowl from USDA Center for Nutrition Policy and Promotion.